Tattooing as an Artform, and the Stigma That Is Still Attached: Legitimate Business, or still just for Sailors and Whores? 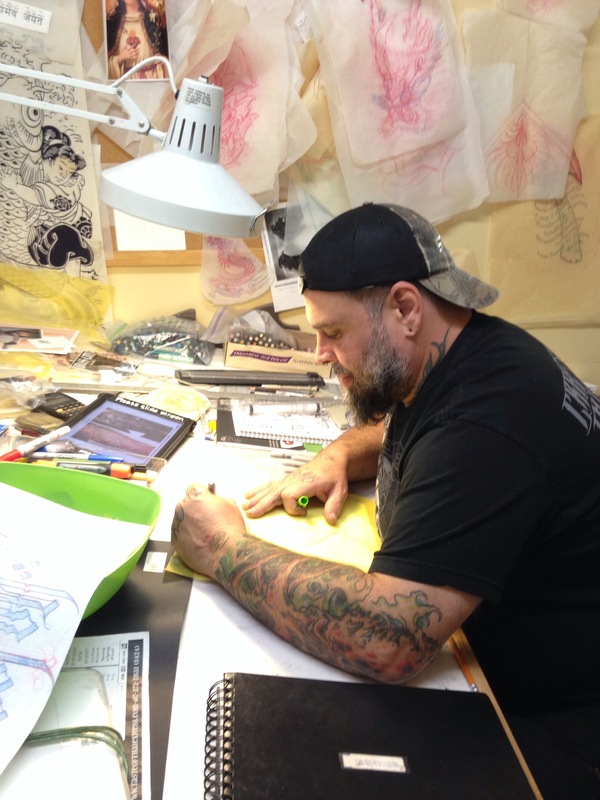 The Bossman at work– our business The Hand of Fate Tattoo in Ithaca, NY. My husband Edward Molina is an artist. His chosen medium is often skin, but he is more than incredible on canvas, walls, and office envelopes. He is the ultimate in duality; a talented, committed artist, and a business owner that is also first and foremost a tattooer. I was raised by a woman that absolutely hated tattoos, as well as the craft. Draw on paper, please, just not on my daughter. Her mentality never changed, even though she loved my husband dearly. I understood her position, but I never let it change my stance, and eventual tattoo wife-dom. I’m relatively heavily tattooed at this point, and I’ve definitely noticed some changes in the way people tend to react to me at times. Love it or hate it, I’m a heavily tattooed woman, that is absolutely invested in being a collector of custom artwork created just for me. After much back and forth, the board voted 4-to-1 to uphold a decision of the village building inspector that the workplace of Joseph DiProjetto and Ben Wight wouldn’t meet code. Ok, there it is–of a ‘similar character’ to already existing businesses. I help run a business that bought us a house, pays for our existence, and keeps kibble in bowls. Compared to my TOTR gig, it’s definitely more of a relaxed environment day to day. In leu of that, I deal with much of the same day to day business goings on that I used to. Advertising, marketing, budgets, customer service, banking–all of this goes into daily operations. It’s a business, it’s an artist studio, and it’s a WAY OF LIFE, not just a job. What do you think? I’d love to hear your responses below!